Anticipating beautiful blue skies and a cloudless day for a summer wedding? With so many stylish outfits available for summer wear, what should you consider when choosing yours to ensure that you stay happy & cool? Wet Weather - how will your outfit work if it's rainy or windy? Are you shoes or sandals suitable for wet weather? Will your dress or hat blow up or away on a windy day? Layering - if it turns cooler, are you able you add another layer, such as a jacket or bolero? Extreme heat - what sort of minimum & maximum temperatures can you expect? If you may be facing high temperatures, it's worth focusing on this as most wedding guests buy their outfits between 3-6 months ahead, i.e during colder weather! Consider choosing more natural fabrics if the weather's going to be hot - e.g. silks & cottons, rather than manmade fibres. Head Turning - on a warm day, a wide-brimmed hat can be practical as well as stylish and great for keeping you cool and your face out of the sun. Fascinators are incredibly popular right now, and may be easier to find in the right colors. 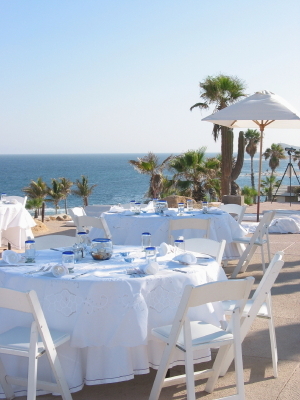 Beach Weddings - there's often a more relaxed dress code for a beach wedding. Maxi dresses hit the right note for an informal occasion such as this. Do consider the impact of a windy day or of your footwear sinking into soft sand, so you may wish to avoid massive heels! Formal or Informal Wear ? Summer weddings can be formal or relaxed, if you're not sure which, then ask the bride and groom or check out the wedding invitation! If it's informal, then an above the knee tea-length summer dress & sandals or pant suits may be the order of the day. Choose natural fabrics which can help keep you feeling cool. If formal wear is expected then it's more likely to be dresses , jackets & skirts or church-style suits. Whilst you can wear close-fitting clothes, the right fabric choice can help you feel comfortable and look stylish and elegant. It's up to you to choose what styles will work for you. If you're buying out of season, keep in mind the likely temperatures in the month of the wedding as you're choosing your outfit. As a wedding guest you could choose to wear one of the smarter outfits or dresses from your existing closet or wardrobe. Simply add a few elegant touches such as matching clutch bag, hat or fascinator, and voila! you have transformed an everyday outfit into something for a special occasion.